Nintendo has certainly brought out the big guns for the opening salvo of SNES games on the New Nintendo 3DS, with classic game after classic game arriving on the portable. 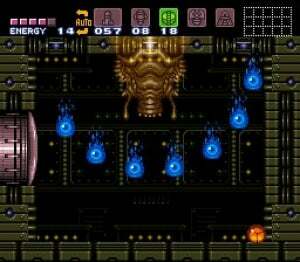 It won't last and there may even be mediocre spin-offs or complete dross in the future, but for now New 3DS owners should enjoy the brilliance that is Super Metroid. Making this eShop release extra appealing to gamers in Europe and Oceania is that unlike the Wii and Wii U downloads it is the 60Hz version of the game; everything runs at the correct speed and there are no forced subtitles (although there are optional Japanese ones). Metroids 1 and 2 provided some good fun, but this third instalment takes things up a few notches. There's more of a cinematic feel to proceedings, not in terms of lengthy cutscenes with voiceovers about "the baby", but in its look and sound. There are some good visual effects such as fog and different lighting conditions along with a range of creatures and locations; in addition there's a sensible use of colour, ensuring the action remains easy to follow even when exploring caverns on the small screen. Switch to the original resolution mode and details really pop out such as lights in the background, cracks in the scenery or the features of an enemy. The audio in the game is very impressive (and well worth a pair of headphones), with a variety of haunted and mysterious tracks playing throughout the adventure. Some music tracks are minimalist, others full blown intense pieces, and sometimes the game opts to go without the music altogether, happy to let strange creature noises or background sounds set the atmosphere. The impressive visuals and sound are apparent from the get-go, where after a brief intro recapping the previous games (and setting up this one) you find yourself wandering through a space station. It's eerily quiet apart from an electrical hum, the occasional door sliding open or the noise as Samus spins through the air and thumps to the ground. It's not long before a self-destruct sequence has been initiated and you are racing against the clock back to your ship; excited music plays and the chilly blue station has a fiery glow as debris falls from the ceiling and steam spurts upwards. Despite the simplicity of the escape (it is the opening after all) the chaotic action and audio come together well, engendering a feeling of relief as you fly away from the explosion to touchdown on rainy Zebes; it's a moment of calm in a storm before the adventure really begins. As with all Virtual Console releases on the portable there is no option to remap the buttons, although If you do desire to change things, the game has an option menu of its own to adjust which button does what. This is unlikely to be an issue however as the default controls worked well on the SNES and (with a similar button layout) that's still the case on New 3DS. Finally, the standard suspension/restore point functions are present, allowing you to enjoy this game on the go without the worry of finding a save room. Showing a blatant disregard to gamer's bank balances, Nintendo has gone and put another corker on the eShop. The screen may be smaller, but it's just as enjoyable as it ever was. Oozing atmosphere, Super Metroid is a highly reccomended purchase for New Nintendo 3DS owners. 10/10, there was no possible other score for this one. Yeah, no way this is anything less than 10/10. Masterpiece. The greatest game ever made. FACT! If ever a game deserved an 11 it's this masterpiece. 10/10. BTW, the game allows you to remap the action buttons, no need to rely on the emulator. The linear GBA Metroids remind me how awesome and epic this release really was. The later games felt like taking a step back and used too much hand holding. "unlike the Wii and Wii U downloads it is the 60Hz version of the game; everything runs at the correct speed and there are no forced subtitles"
Perhaps the greatest game nintendo has ever produced, and the only thing that makes the new 3ds appealing to me. I'm still not getting one though. This game should get a Wii U remake with hand drawn sprites. @teoulas D'oh. I'm a plank. One of the finest games ever made and easily THE best Nintendo game ever made. "As with all Virtual Console releases on the portable there is no option to remap the buttons"
Yeah, it's lucky the SNES mappings on most games were basically perfect already. Wait. . . . Is there no longer any way to view all the reviews in a list and sort by platform, score, and stuff like that? How am I supposed to figure out what are Nintendo Life's best rated and/or top games on the 3DS eShop? Edit: Oh, wait, there is. It's a bit clunky and difficult to read clearly, but I got there in the end. This beauty should have been given the '3D Classics' treatment. Now all we need is My Nintendo to go live then I'll purchase. @OorWullie I would pay 20$ for a 3d classics version of this. Maybe they would let Sega do a version since their line of classics are really good! I downloaded this game when it was on offer, pretty excited as I've never tried it. I've also got Metroid 2 (VC) ... Is Metroid 1 available on the eShop? Is it worth playing through the first two first? @teoulas This one lets you remap the buttons? I think the review specifically says it doesn't let you remap the buttons. None of the virtual console games up to this point have. Should be 3D like M2's ports. When does this drop in the US? Even though I already have this on Wii U and had the original SNES cart at some point, I'll probably get it again on New 3DS. But not until the new Nintendo Account system is up and running here in the U.S. Come on NoA! Is it just me or has there been too much emphasis put on re-reviewing the snes games on the new 3ds and not enough on some of the indie games released in the last month. Its not like the site hasn't got reviews of these same games on other systems already. @Moon No, play Super Metroid first. The story isn't the most important thing ever. Metroid 1 and 2 are extremely difficult games, with ZERO hand holding. I personally despise them. 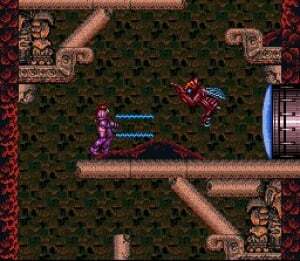 But super metroid has a map function, which makes it much more enjoyable. We've updated the review to make the part about the button mapping a bit clearer. Is this game really that good? NES version thrown me off. @KTT Yes, it is. It fixes absolutely every problem the NES version had, makes every existing element better, and adds tons of stuff. I can honestly only say 2 bad things about this game. The first one is that the wall jumping mechanic is a bit tricky, and the second one is that upgrades stay on the map even if you've collected them, so it's a bit harder to remember which ones you've got, but it only really matters if you're going for 100%. One of the few games that despite its legacy status is still better than the majority of new releases, and although it shows its age in some design decisions, it doesn't feel like a "retro" game. 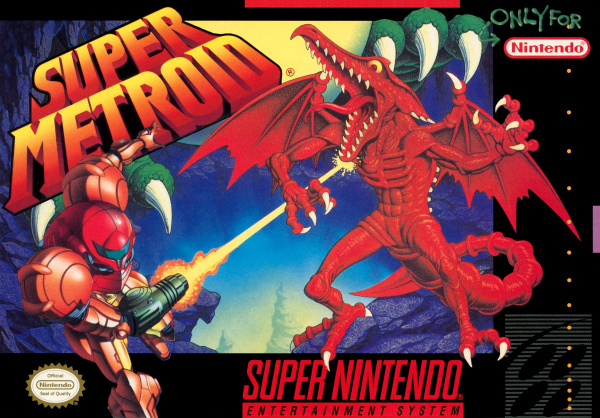 Many think that Zelda OOT was the bluprint for gaming as it is now, and while i can agree with that, it can be said the same for Super Metroid. Think about it, if you mesh OOT and Super Metroid you (kind) obtain the Souls series, which inspired most of the recent outings in one way or another. Sigh... Another 10/10 for a rehash of a 10/10 game. That's OK though! The game is great! I only got round to playing this a few years ago. It'll never be my favourite game because of the genre. But it surely has to be as close to being perfectly designed as is humanly possible. The world design couldn't be improved. The pacing couldn't be improved. The variety of weapons and skills couldn't be improved. Perhaps the only thing wrong it's design (that they improved on massively in Prime) is the rather clumsy combat. Best in the series . @Armand7 And should have been the last quite honestly. The Metroids having been thoroughly exterminated. And what's wrong with linear games. Super Metroid is all but not linear but someone said in comments later Metroid games have linear gameplay. Older I am, more I like linear games. I don't have time anymore to explore and play games all day. I want good linear, but fun gameplay. I hope new Zelda will be simple, linear game with lots of great and fun dungeons. That's all I want. I want to have fun playing games, not to stuck at some point and lost interest to finish game. I'm 32 and having blast playing linear Super Mario 3D World with my kids. Starfox will be linear and even repetitive but as long it's fun I'm ok with it. @NinjaWaddleDee Oh, my goodness YESS!!! I can't wait to get this on my 3DS!...In a few weeks. Thanks, NoA. That said, it's my favorite game EVER, and it's been a dream of mine to have it on an official Nintendo handheld since I was a wee lad. I'll gladly buy it again. Super Metroid on handheld is pretty much the only reason I bought the new 3ds. Can't wait for it to drop in NA. I have played and beaten this game every single year at midnight starting October 23rd, my birthday, for like 8 years now. For a game that has been so incredibly tied to my life, I make sure it's the first thing I do when I get a year older. Anything less than 10/10 is criminal. Overrated game is overrated. 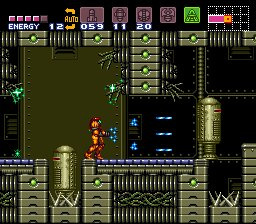 There's nothing about this game that really screams "best Metroid of all time", it just feels like a normal Metroid game and little else. @Fuz Thanks for the info. I won't be double-dipping either. No cross-buy? No double purchase. This is only the third SNES game reviewed for the New 3DS, so there hasn't been that much time spent on these reviews. I`m ashamed to say I have yet to play Super Metroid! @James1993 : and you even said it twice! @MrPuzzlez Lol what can I say? I love the Metroid series, but I think Metroid 1 and 2 just haven't aged well at all. @Bolt_Strike Yeedeldee. Why do you think that? Just curious. Most people consider this or prime to be the best. @NinjaWaddleDee The best game in the series usually has something that stands out about it in some way, especially in terms of gameplay. Super Metroid doesn't. The level design isn't substantially better than other Metroid games, all of the major abilities it introduced have appeared in other games, there's no gimmick or standout mechanic that sets it apart from other games. Most of the time people praise this game, it's for nebulous reasons like "atmosphere" and "isolation", and I don't really see how that's substantially better either. The best thing I can say about it is that it set the standard for future Metroid games, but later games have surpassed it and those games actually stand out. @Bolt_Strike That's valid. I don't really have much else to say lol. @teoulas Amazing. How I wish every game on the virtual console had this foresight. FZero has been damn near unplayable for me on the N3DS due to the button layout - gives my hands cramps. Probably my fave game ever and one I revisit once a year or so. Started it on Snes 20yrs and never got into it at all. Tried again umpteen times and .... still nothing. In 2006, after finishing Fusion and Zero Mission, I made a commitment to delve a little deeper and absolutely adored it!!! Fave of the series. Wasn't too keen on the Gamecube games - think the side scrolling style suits it far better. Envious of people who have yet to play this gaming great for the 1st time!!!! @Bolt_Strike Maybe for you it doesn't stand out but for most people it does. For starters, it may not bring anything new to the table, but it's the first time it does what it wanted flawlessly. Exploration, atmosphere and controls are what make this series great. The soundtrack and the visuals are beautiful, wich are the reason why the atmosphere on this game is memorable in comparison to the first entries. The controls are perfect, wich at the same time improve exploration and encourage the player to try to reach new places since it's more fun. Using every tool and every weapon felt different and yet they were all great. Overrated is a word that people use just because they don't share an opinion about liking something popular, but there's a reason why they are popular. Having your own opinion is great, there's nothing wrong with that, but saying that a game that influenced gaming to this day is overrated just because you don't liket is a bit unfair. I'm not a fan of Ocarina of time, but I can see how it influenced games to this day and why many people consider it great, even if I don't share their opinion. I can appreciate the music, visuals (in comparison to other games of the time) and new fighting mechanics even if i didn't enjoyed them as much as others. Super metroid brought the perfect formula by polishing those 3 aspects I mentioned, wich inspired and set the bar higher for many games to come. Compare Return of Samus or the original Metroid and you can easily see that even if they try to achieve the same stuff, there are miles of difference between them because there's a huge difference in the quality of those aspects. Those tried, this one accomplished it. I apologize if I wasn't clear, english isn't my mother language. I'm so sick of the SNES VC titles being availble only to New 3DS there is ZERO reason for it. I had JUST bought a 3ds with FE Awakening, I have absolutely no reason to buy another of the SAME handheld. original 3ds is perfectly capable of running SNES emulation. Lame money grab by nintendo with this decision. me and my fiance both would have happily picked up Super Metroid, Earthbound and F-Zero (especially if it let us vs over local wifi, that'd be badass). But we're not going to go out and spend 400 dollars on new handheld consoles every year practically. Definitely one of my favourite games of all time. Now if we can somehow convince Nintendo to release Zero Mission and Metroid Fusion onto the Switch/New 3DS, I’ll be very happy.